Wow — quick announcement here. I checked my email this morning to find out a delightful surprise about the results from the Steampunk Chronicle: Beyond Victoriana had won in their Reader’s Choice Awards. 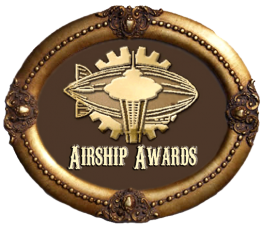 A Special BEST OF STEAMPUNK Award is given this year to Diana M.Pho, a.k.a. Ay-leen the Peacemaker She was the most nominated person in the SteamLife Category as was uncontested in the areas of Feminist Steampunk and Most Politically Minded Steampunk. We congratulate her on the great strides she has made in the areas of Multiculturalism and Fashion. So onto the thank yous, because, obviously, so many of you readers showed your outstanding support for creating a more imaginatively diverse and actively critical community of doers, thinkers, and artists. This award shouldn’t be about one person, but also should go to every single Beyond Victoriana contributor and commentor, every aethernetz friend of the blog, every follower on Facebook and Twitter, and every convention goer that I have met these past four years during my involvement in the steampunk community. So, not to be too soap-boxy, but I really believe this. And I believe that progressive and idealistic people can be change-makers if given the right platform. That is what Beyond Victoriana is: a space for people to make change. And I look forward to continuing to do this. With you. Well-deserved! Congratulations to you and your lovely blog.